If you say „Let’s go on tour” on Usedom, it is not meant to go for a ski run for sure. That is not what tour-lovers look for at the Usedom island. Those sport enthusiasts, even with pleasure, do without snow and skis here. But not without sticks, because they are absolutely needed. 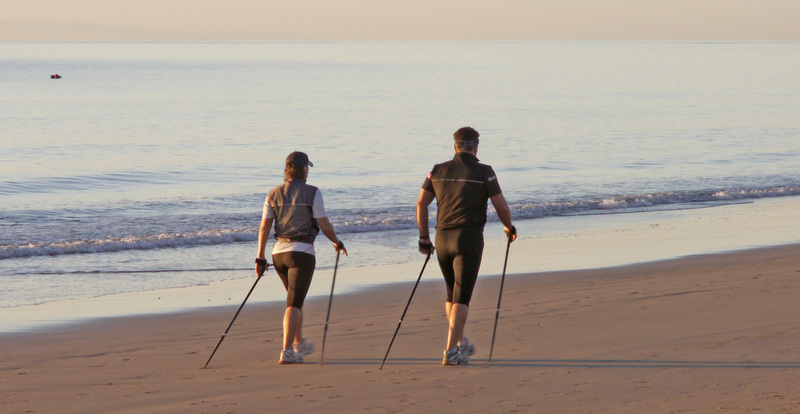 The island hikes with sticks: Having a walk in Nordic Walking style it’s a new trend in the “3 Seaside Resorts”. Stepping with rhythm towards the sun early in the morning, when hardly anyone is on the beach, is a unique experience. That’s because it’s here, where the nature and the Resort Architecture combine, and become an extraordinary scenery. Welcome to the paradise of Nordic Walking: the “3 Seaside Resorts”, together with climate experts from the University in Munich, did mark out seven Nordic Walking tours, each with a different difficulty grade. They have a length between 4 and 20 kilometres, and they’ve all got a common starting point: the beach access in Heringsdorf, on the left side of the pier. And because you’ve got a nearly infinitely long beach here, it is obviously the star of every tour. There are tours though, which lead you to the forests around the three Imperial Spas. In order to have good orientation all the tours are continuously signposted. Furthermore you’ve got the opportunity to do the Nordic walking with a qualified trainer. More information about the course: +49 38378 2 44 22 or mobile 0049 160 587 53 20. From the starting point you go along the beach towards Bansin, you take the blind canal to the promenade, and then you go back to the Heringsdorf pier. You go along the beach towards Ahlbeck till the Ahlbeck pier, and then back to the starting point on the promenade. You go along the beach to the Ahlbeck pier, then on the promenade to the rehabilitation clinic, around the building, and then backwards on the streets Kieferngrund, Heimstraße, Bergstraße and on the promenade to the Ahlbeck pier, and then again along the beach towards the Heringsdorf pier. You go along the beach towards Bansin, you take the blind canal to the lake Gothensee and the place Gothen. You go backwards to Heringsdorf on the path through the forest. You go along the beach towards Bansin, you go past the pier to the camping field in Ückeritz and to its end, then backwards on the road at the camping field to the beach and then back to the starting point. You go along the beach towards the Polish border, then through the Ahlbeck forest to the lake “Wolgastsee”. From Korswandt you go to Gothen and the lake Gothensee, and then through the blind canal back on the beach and to the Heringsdorf pier. You go along the beach to the outskirts of Bansin, you take the staircase on the cliff and then the trail to the hill “Langer Berg”. You go back through the coast forest and then on the promenade from Bansin to Heringsdorf.